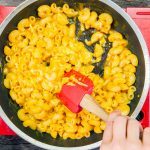 This one-skillet Pumpkin Mac and Cheese might look like it came from a box, but its color is all natural! Pumpkin puree, gruyere cheese, and sage breadcrumbs come together to make this fall comfort food classic! We used to think the only way to get that blazing orange mac & cheese was to make it from a box. There, the color comes from a blend of food coloring, which does nothing to add to the flavor. 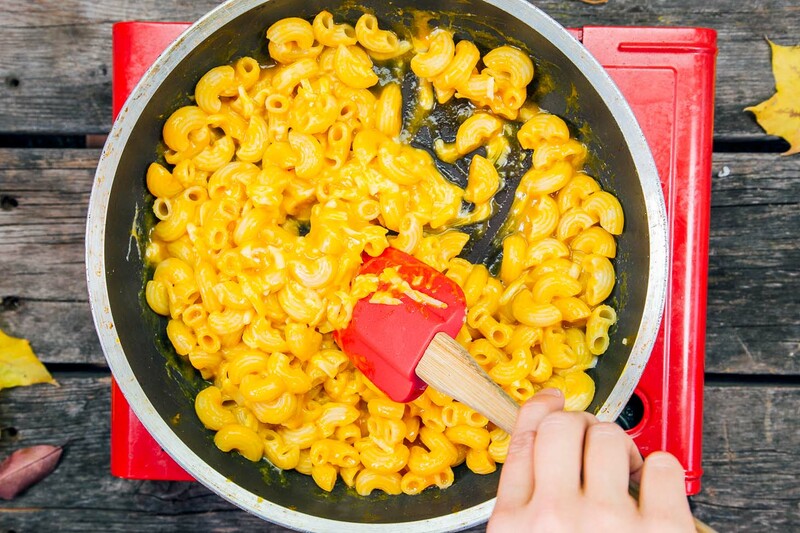 But with this Pumpkin Mac and Cheese, you can get that bold color PLUS the undeniable flavor of fall! Just add in a little pumpkin puree along with the cheese at the end and voila! Kids’ mac & cheese, but for grown-ups. While the toasted panko bread crumbs could be optional, we think they’re definitely worth it the extra effort. The panko, sage, and garlic create a beautiful aroma and pair perfectly with the pumpkin flavor. Plus the added crumbly crunch the give really balances out the texture of the dish. If you wanted to strip down some steps, you could make these ahead of time at home, and then bring them out to camp in a resealable container. The other thing we like about this mac and cheese is that it can be made in a single skillet or pot – no strainer required. The trick is to add the macaroni first, then cover with equal part water. Bring to a boil and stir regularly. 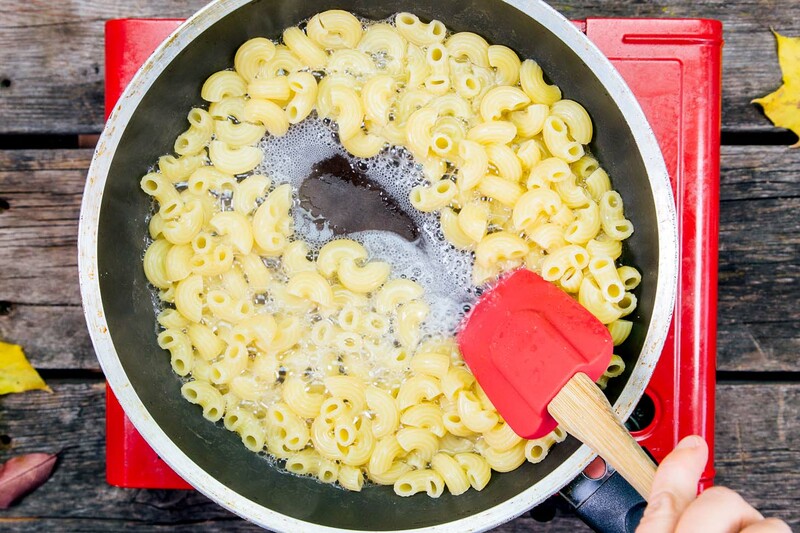 The vast majority of the water will absorb into the pasta or evaporate, leaving behind just a little bit of water to make your cheesy sauce. So this fall, upgrade your go-to comfort food and give this Pumpkin Mac & Cheese a try! ↠ Make sure the only ingredient in your pumpkin puree is pumpkin! You don’t want to use pumpkin pie filling, which has spices and sugar, which isn’t what we’re after in this recipe! Make the crunchy panko and sage topping at home. Let cool and store in a small tupperware or jar. Pre-grate the cheese and place in a tupperware or sealable bag in your cooler. ↠ Any non-stick skillet or pot will work for this recipe. For two servings (as this recipe is written), we find that a 10” skillet with high sides is sufficient. If you’re going to scale up, we’d recommend a 12” skillet or a pot. ↠ What to do about the extra pumpkin puree? Make these Pumpkin Pancakes from Adventure Journal the next morning. Or, simply measure out the puree needed at home and leave the extra in your fridge for later. 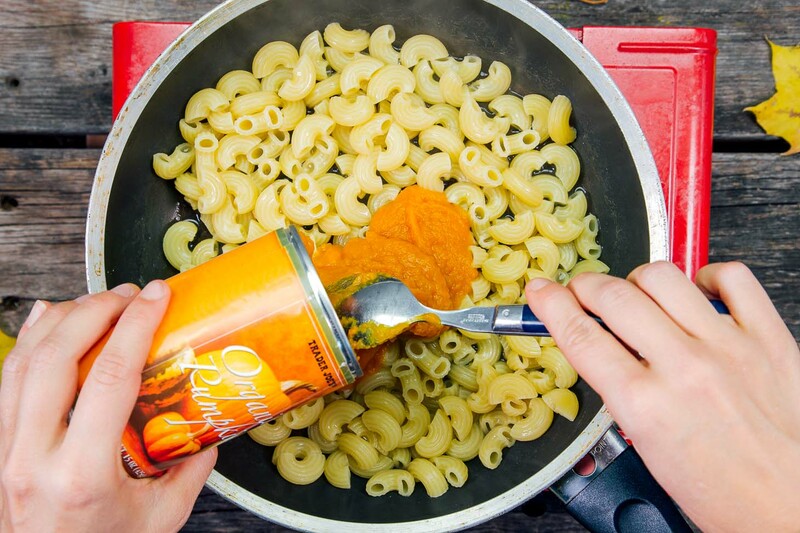 This pumpkin mac & cheese comes together in just one pot, making it a perfect dinner for fall camping trips! 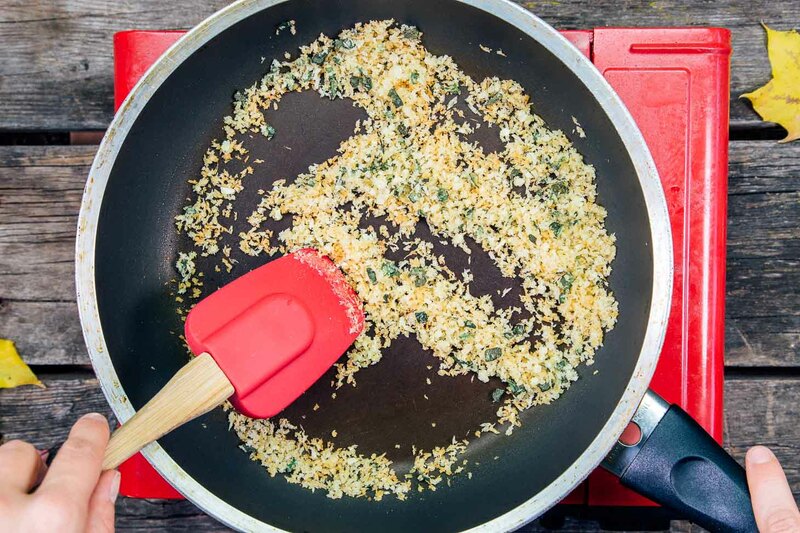 To make the panko sage topping: Heat oil in a skillet over medium. Add the panko and sage, stir to coat. Add the garlic. Stir the mix frequently until the panko is golden brown. Remove the topping and set aside. This can be done at home ahead of time. Place in an airtight container and pack in your pantry box. Place the elbow macaroni in the empty skillet. Add water to cover (about 2 cups) and the salt. Stir to combine. Bring to a boil, stirring frequently. Cook until the pasta is tender (check the pasta's packaging for a good time estimate). When the pasta is done, the water should be mostly - but not entirely - absorbed. If needed, drain excess water, or add in a bit of water if the pan is too dry. Mix the pumpkin puree and cheese in with the pasta and remaining water (which will help create the sauce). Serve in bowls with the crunchy Panko Sage Topping. Enjoy! The panko sage topping is my favorite part!